Drive growth in the rapidly expanding interior décor market. Thanks to the unique advantages of HP Large Format Printers—from enabling tremendous creative potential with broad range of compatible material choices to same-day delivery of odourless indoor prints—the industry is in the midst of a complete transformation! Click here to access current HP webinars and to ensure you receive alerts for all our upcoming webinars! You can choose between shorter term pressure sensitive, longer term vinyl paste-up or PVC-free options that allow you to provide what your customers need while meeting their design goals. 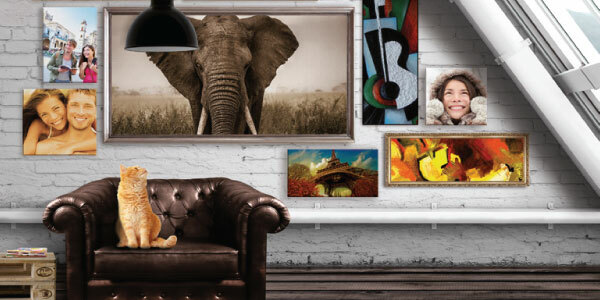 Yield higher margins with everything from gallery-wrap stretched canvas to wide-format canvases. Thanks to HP, you can stretch and fold without ink cracking, and eliminate the need for lamination. Produce detailed, durable images. Capture accelerating growth in a huge new market —add colour, design, and brand identity to window blinds, shades, and indoor window treatments. Whether you’re looking for an efficient, low-volume solution or production-volume capability, HP offers a range of solutions that allow you to transform the walls of residential, commercial, and retail spaces — and reach interior designers and decorators. Join the digital décor revolution. In a world that is becoming increasingly personalized, customizable digitally printed wall murals, decals, fabrics, roller shades, lamp shades and more are rapidly growing trends that are creating new demand in the market. HP large format printers provide endless inspiration and applications to create professional, yet personalized environments. See the Décor Inspiration Rooms that ND Graphics created using HP Latex Print technology. Kid’s Retail Space by ND Graphics. Please click the image to learn more. Living Room Space by ND Graphics. Please click the image to learn more. Office Space by ND Graphics. Please click the image to learn more. Restaurant Space by ND Graphics. Please click the image to learn more. Share the post "HP Décor Market"